In this September 18, 2014 file photo, Billionaire investor Warren Buffett speaks at a "Detroit Homecoming" event in Detroit, Michigan. Warren Buffett's Berkshire Hathaway said Friday it will amass a 700-million-share stake in Bank of America, making Buffett the largest shareholder in two of the nation's largest banks. Berkshire said that it will convert warrants it purchased in Bank of America back in 2011, when the bank was struggling following the financial crisis, into common shares in the bank. The stake in the bank will make Berkshire the largest shareholder in Bank of America, exceeding mutual fund giant Vanguard. Buffett said in his annual shareholder letter that he would convert his warrants in Bank of America to common stock if the bank were ever to raise its annual dividend above 44 cents a share, which the bank did this week. This week, the bank announced it would raise its annual dividend to 48 cents a share starting in the third quarter. 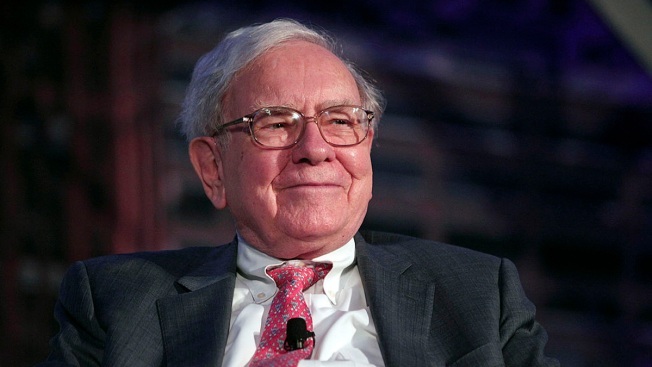 After the bank raises the dividend, Buffett will convert his warrants at a price of $7.14 a share, which is significantly below the stock's current price of about $24 a share. If Buffett were to sell his acquired stake in the bank, Berkshire would walk away with a profit of $12 billion. Buffett is also the largest shareholder in Wells Fargo, a stake that has drawn some controversy following Wells Fargo's sales practices scandal.